Mackay Park is a 2.9 acre neighborhood park within the City of Cypress that is the first park in the city to exhibit large scale use of drought tolerant California native landscape. 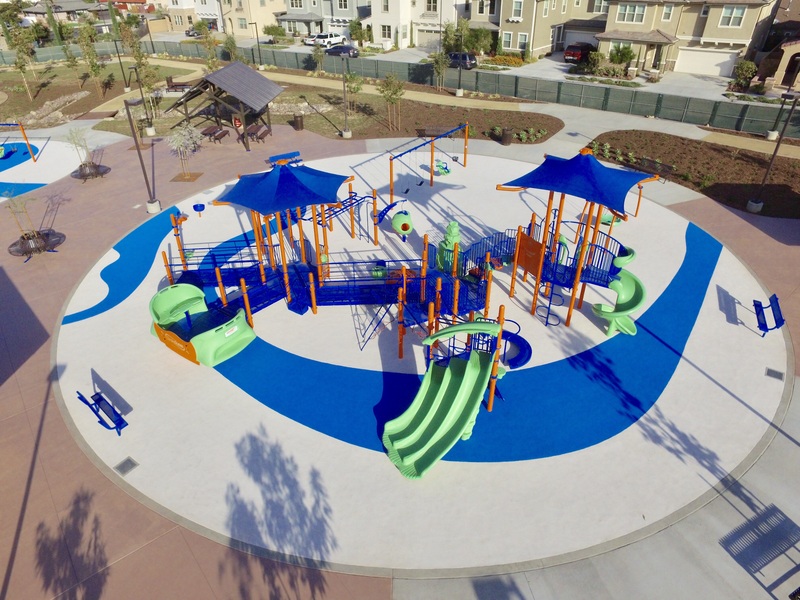 The park was developed as part of a joint effort between Cypress School District, William Lyon Homes and the City of Cypress. The site is surrounded on three sides by existing residential homes and Walker Street to the west. Entering the park off of Walker Street you are welcomed to the Park by an inviting split rail fence with stone pilaster and precast concrete cap housing the Park monument sign and drought tolerant planting scheme. Heading east on Orchid Way into the housing development, you can enter the park through a 17 stall parking lot. From the parking lot you can enter the park in one of two ways; one through the ¼ mile looping trail system or the main entry through the rose garden. The garden houses an array of manicured rose bushes with a center focal element, “Ombre”, a whimsical kinetic art piece sitting on top of a poured in place concrete monument base. The infiltration trenches circumvent the site providing bridging opportunities at various intersections of the trail system and main plaza. As you pass over the custom built pressure treated wood bridges you enter the main plaza housing two playground areas designed for 2-5 year old and 5-12 year old enjoyment. The outer perimeter of the plaza has three large covered shade shelters for patron comfort that include BBQ, Ash Containers and custom wood picnic tables. The rest of the plaza has inviting landscapes, circular benches and a two-stall restroom building. The eastern portion of the site is for active play, including a great lawn, half-court basketball court and the continuance of the trail system. 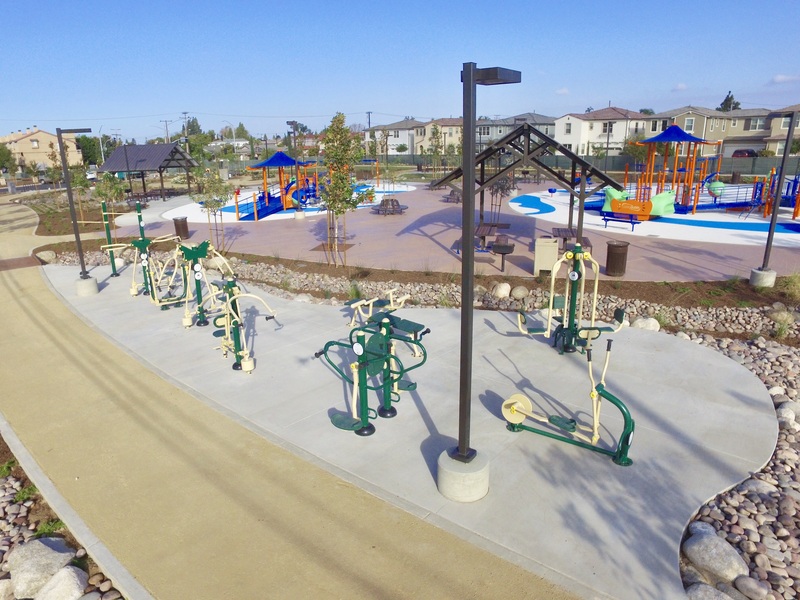 Strategically placed benches facing the park site add to the patron comfort along the trail system as well as an exercise area encompassing several exercise equipment stations. The exercise equipment is designed to use body weight and motion to provide cardiovascular exercise for park patrons. 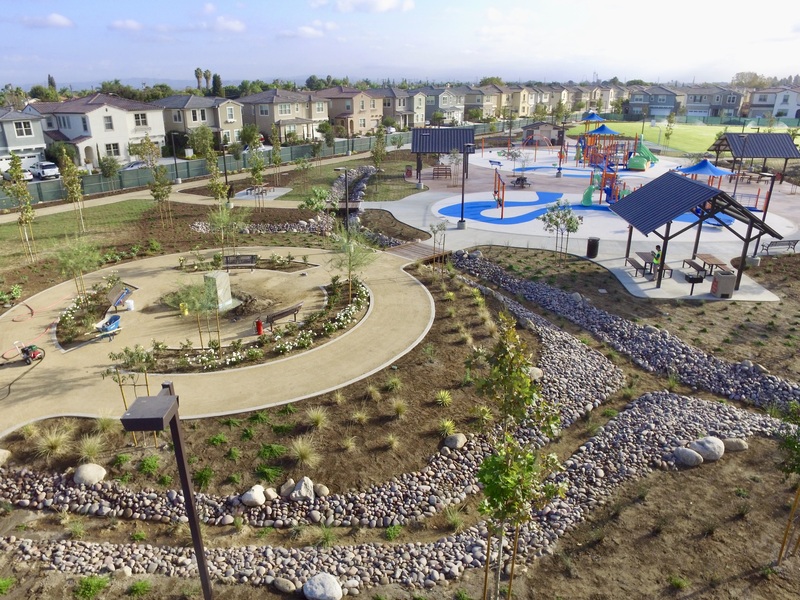 The Park was designed with drought tolerant landscape areas, including buffalo grass, a new hybrid grass that uses half the water a traditional lawn in Southern California needs to thrive. Large box trees throughout the site provide for a true “park-like” experience. 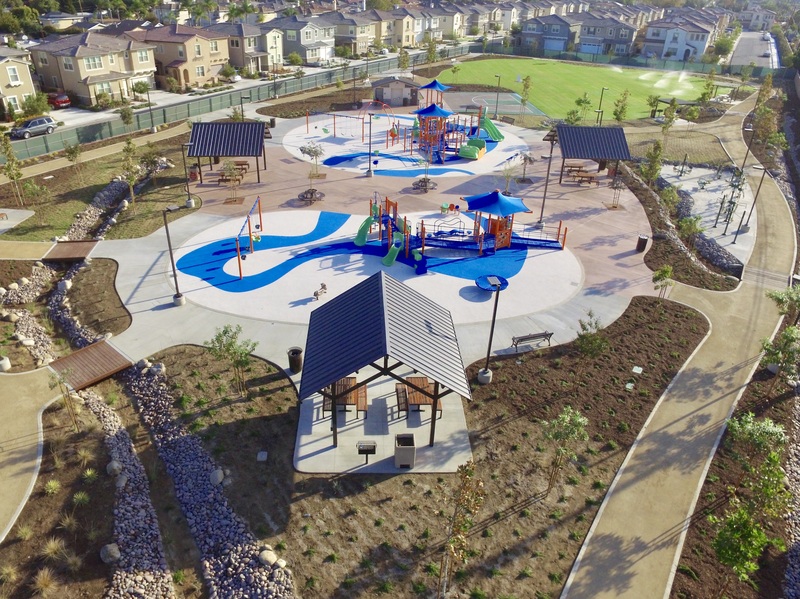 The City of Cypress has embarked on our first new park project in over 20 years. Mackay Park is located on the former site of Daniel T. Mackay School. The school had been closed for decades when Cypress School District declared the property as surplus. Lyon Homes purchased and developed a portion of the site, and the Cypress Recreation and Park District purchased the remaining 2.9 acres. 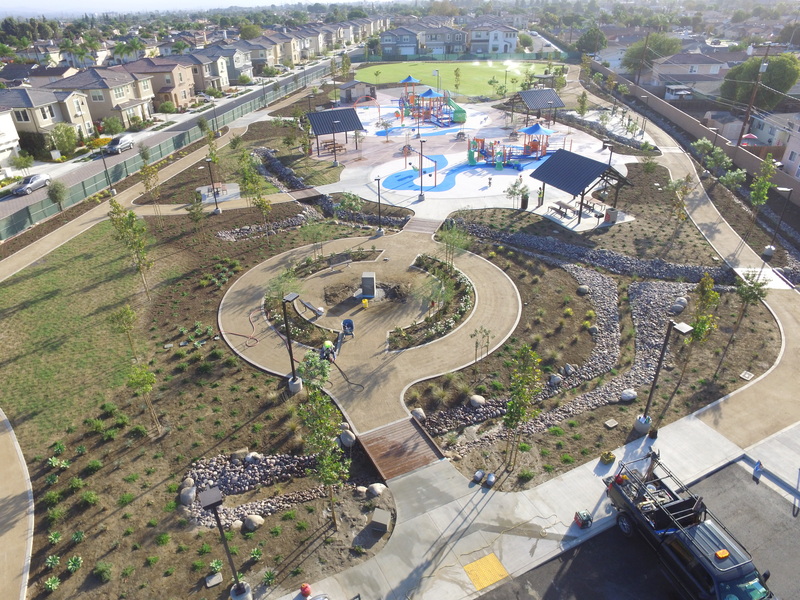 The park was developed with “green” infrastructure in mind; landscapes feature include drought tolerant planting materials, drip irrigation throughout the landscape areas to control water run-off and best management practices for low water use plantings. The park boasts a water infiltration system to control stormwater run-off. No connection to City storm drain was made in the adjacent street, the site has approximately 920 linear feet of bioswale/infiltration trenches comprised of on-site soil, bioswale growing medium, rock cobbles and mulch to help filter on-site stormwater prior to percolation back into the groundwater. The pedestrian lighting is comprised of solar-powered LED light standards to help be energy efficient off the grid. The restroom building uses low-flow toilet fixtures to eliminate excess water use and air hand dryers to minimize paper waste. The bathroom is strategically placed on site to capture natural light entering the rooms so no light fixtures are needed inside. The hardscape elements of the park were specifically design to reduce the heat island effect, cool integral concrete colors and decomposed granite were used to capture the heat intensity of the sun. Even the park sign is made of recycled plastic materials. Through the development of the project many relationships were garnered, including the Cypress School District, William Lyon Homes, multiple departments within the City of Cypress and the neighboring community, including existing residents and new residents/HOA board of the new housing development. Through the construction process the team worked closely with the residents adjacent to the park where the project was to receive a new CMU block wall. The construction team and City provided special conditions to address concerns from existing neighboring residents, including installation of a chain link fencing to mitigate pet encounters and security while foundations were excavated, footings poured, and the new perimeter wall was constructed. Special attention was given to some residences that had existing amenities in their yard that had to be demolished for the foundations of the new park. The City worked with each resident to ensure their needs were carefully met. Another such obstacle is the high water table in the City of Cypress, specifically at the park site. Major construction activity, including grading and over-excavation of the main structures on the site, happened just after the rain season, which was unexpected for Southern California in 2016/2017. Due to the rains, the water table identified in early geotechnical studies had risen several feet, causing major construction difficulties for some of the major park amenities, including the shade shelters, bridges and block wall foundations. Through careful planning, on-site observations, and construction techniques for dealing with the water table, the project experienced no delay and opened on time and under budget. 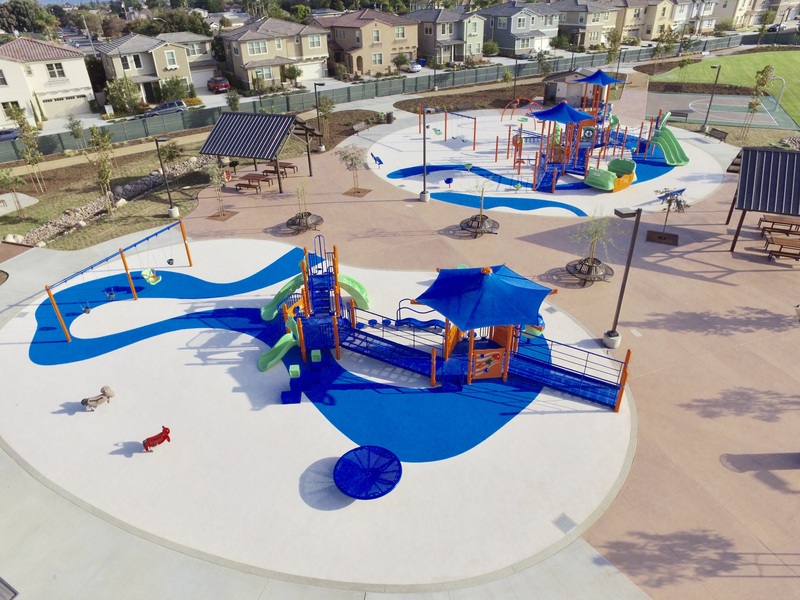 The work of the construction team, City officials and management team helped carefully guide the project through some of these challenges to deliver a first class park project for the City. 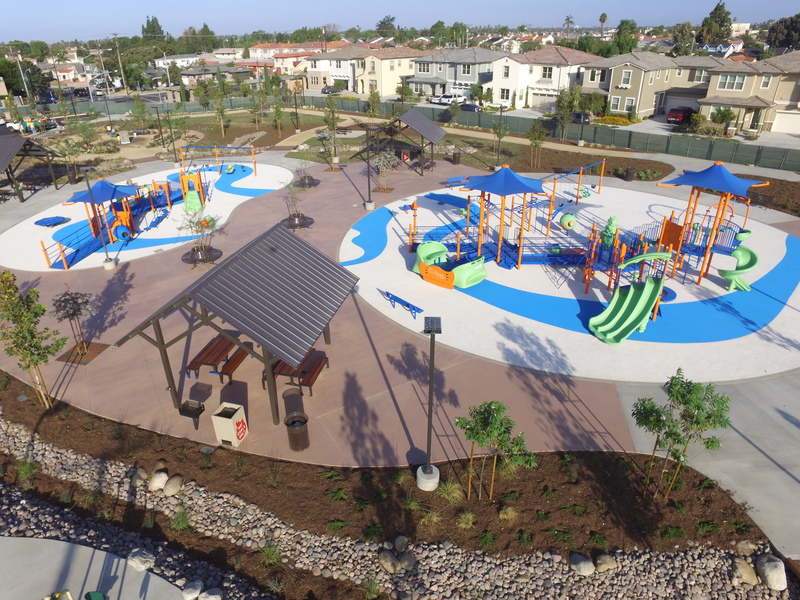 This beautiful 2.9 acre park is the City’s first new park in over twenty years. Mackay Park consists of drought tolerant landscaping, a meandering bio-swale, walking trails, picnic areas, playgrounds, and a large open lawn. This park reflects the City’s motto of a great place to live, work, and play. The City’s newest neighborhood park is located on the former site of Daniel T. Mackay School. The school had been closed for more than 30 years when the Cypress School District declared the property as surplus. Lyon Homes purchased and developed seven acres of the site to create 47 single family residences. The Cypress Recreation and Park District purchased the remaining 2.9 acres. 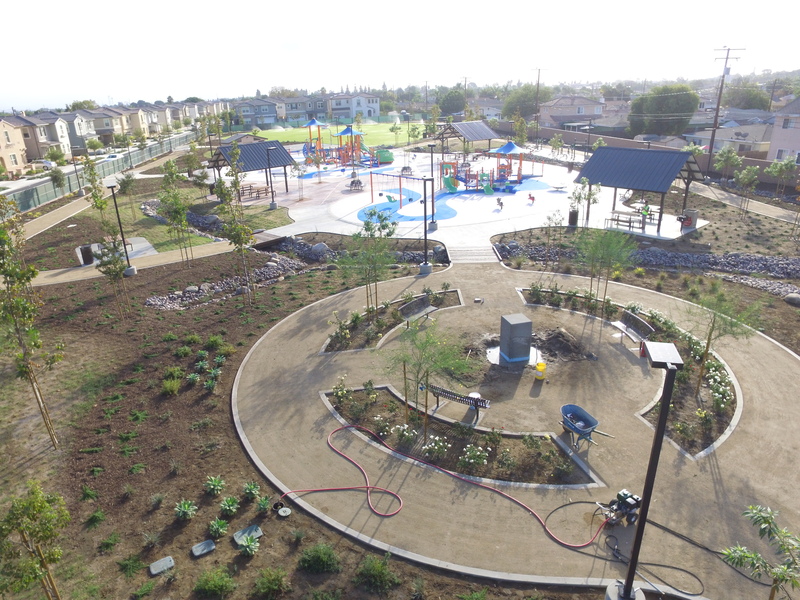 This park was developed to showcase large scale use of drought tolerant California native landscape and demonstrates that sustainability can be both beautiful and fun. Using community input, features installed in Mackay Park include: Two accessible playgrounds - one targeted for 5-12 year olds and the other targeted for 2-5 year olds, with each area featuring colorful rubberized surfacing and complete accessibility; decomposed granite walking paths; a grouping of exercise stations; restrooms; drought tolerant landscaping; picnic areas with barbeques; a half basketball court; solar power LED lighting, and a parking lot. In order to address water runoff, a bioswale meanders throughout the park. A special feature is a public art piece gracing the entrance of the park, and donated to the City by Friends of Cypress Cultural Arts.